Global map was borne as a product to replace previous IMW (1:1.000.000) with a new map in digital form with the homogeneous standards for entire globe. The primary objective of Global Map is to contribute to the sustainable development through the provision of base framework geographic dataset as necessary for better understanding the current situation and changes of environment in global level. The Global Map datasets encompass the entire globe at a scale of 1:1.000.000 (for vector data) and spatial resolution of 30 arc seconds (for raster data). Global Map with its consistent quality and data standards is a handy tool to monitor the environmental status at regional and global scale, which may have limited uses at national and local scales. It also provides a framework within which the local environmental problems can be modeled and analyzed with appropriate data. Disaster prevention, disaster mitigation, preserving Biodiversity, promoting regeneration processes of the ecosystem etc. are some of GM targets. Due to fact that the GM data from geometrical point of view is basically partially topologically and non harmonized data coming from different sources (NMO’s), our efforts for its utilization for map compilation and spatial analyses resulted with limitations because of overlaps and gaps between the polygons, as well as non spatial joint between the line objects. The GM specification allows to each participant to use different sources with different quality for different areas of their countries and for different layers. This type of definition of non-homogeneous accuracy without any process of data harmonization in some way allows overlaps, gaps, and non spatial joint of data not only between different countries, but the data within the same country and between different layers. 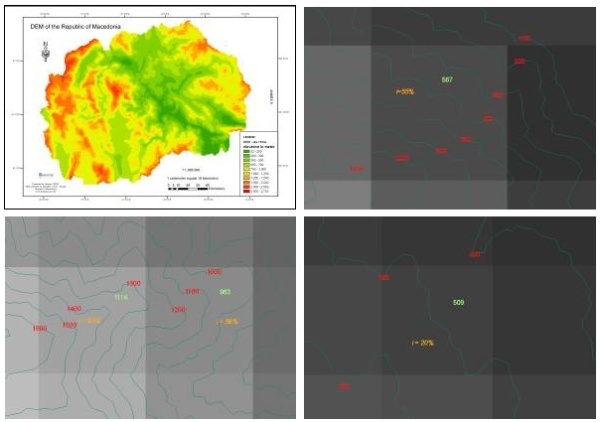 The relation between the data of raster and vector layers, resulted with big differences, basically because of non-homogenous accuracy between the vector and raster data, and non-harmonized data, as well as because of the differences on the defining of the level zero from the participant countries. The above situation can be overcome by including the data harmonization process as necessary step during the process of preparing the global map data, which should be defined in global map specification. This process might be very difficult, because of some mentioned political problems above, however it is necessary step for better future of global mapping project and wide utilization of global map data. The idea for developing the global map was lunched as a result of unsuccessful completing the IMW (International Map of the World in scale 1:1.000.000) and contemporary trends that imposed information technology in the last decade of last century for preparing the digital maps. Based on this idea, global map should replace the IMW with a new map in digital form with the homogeneous standards for entire globe (Idrizi B. et all, 2010). It is therefore essential that access to the most accurate and up-to-date maps of important environmental features, aimed for properly understand of our global environment. In general, available maps of the entire globe originate from various sources and therefore their accuracy is inconsistent, mainly because of irregularities in source material, lack of up-to-date data, gaps in the data, etc. Insufficient circulations of existing map information and a concern for national security have also reduced the availability of maps at a global scale. The concept of Global Map, also including the establishment of an international body for Global Mapping project, was firstly proposed by the Ministry of Construction (MOC) of Japan in 1992. The MOC concept was to build global scale geographic information through international cooperation. In the same year, the “Earth Summit” - the United Nations Conference on Environment and Development (UNCED) - in Rio in June 1992 also addressed the issue of information access, where international organizations and institutions around the globe agreed to provide and share Global Map information about the state of the globe and its changes. The report of this conference includes mention of the need for global mapping project, stressing the importance of public access to information and international cooperation in making it available. In year 1994, in Izumo-Japan was held the first international workshop on global mapping, where was resolved that global map development should proceed with a goal of completion by the year 2000. Two years later, on February 13th 2006, in Tsukuba-Japan, the second international workshop on global mapping has been held, where the International Steering Committee for Global Mapping (ISCGM) was established, which officially started with work after its first meeting in 14th February 1996. 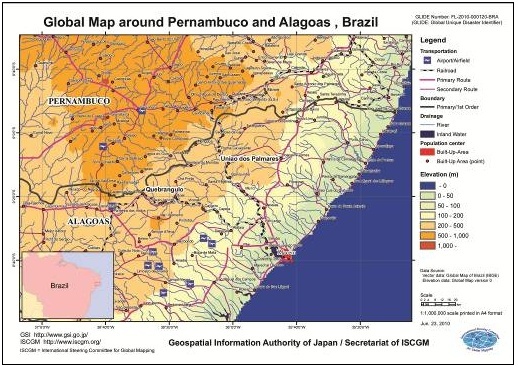 The Global Mapping project and its activities are organized and coordinated by ISCGM, a body of professionals from various countries with secretariat placed at Geospatial Information Authority of Japan (former Geographical Survey Institute – GSI), as a center of the Global Mapping project. The GSI is actively involved in the ISCGM and provides technical assistance among others for the development of the Global Map. After establishment of the committee, ISCGM supported by United Nations was put down the letter addressed to all National mapping organizations around the world with invitation for participating in the project through developing global map of their countries under certain specifications already notified by the secretariat. Through its continuous efforts ISCGM has succeeded in making “Global Mapping” as part of the “Plan of Implementation” of World Summit on Sustainable Development (WSSD) held in Johannesburg, Aug-Sep 2002 also. Global mapping is an international collaborative initiative through voluntary participation of national mapping organizations of the world, aiming to develop globally homogeneous geographic data set at the ground resolution of 30 arc seconds and to establish concrete partnership among governments, NGOs, private sectors, data providers and users to share information and knowledge for sound decision-making. Global Mapping is both a project and a process for developing a group of digital geographical information datasets. The primary objective of Global Mapping project is to contribute to the sustainable development through the provision of base framework geographic dataset, which is necessary to understand the current situation and changes of environment of the world. ISCGM has so far approved and published 5 Global Map Specifications, i.e. the first specification (Version 1.1) on 16.03.2000, Version 1.2 on 17.04.2005, Version 1.2.1 on 11.11.2006, Version 1.3 on 14.07.2007, and the last one Version 2 on 25.10.2009. The data structure within the Global Mapping project is adopted in to ISO/TC 211 standards for geographic information, i.e. ISO19136 for GML format, ISO 3166 for nation codes, ISO 19115 standard of metadata of V2 by using ISO 19139 for encoding, ISO 15046 standard of metadata of V1, ISO639 for language code, ISO8601 for date code (GM specification V1.3./V2). The scheme of standards for data developing defined in global mapping project is shown in next figure. Global Map V1 (global version). Two first datasets, V.0 and V.X are not so popular and up-to-date data. The GM V.0 is based in Vmap level 0 data, Global Land Cover Characterization (GLCC), and GTOPO 30 elevation data set, contains four raster layers (vegetation, land cover, land use and elevation), developed as global geographic datasets without any validation of NMOs. As GM V0, the GM V.X is based in existing global geographic datasets, tentatively developed with expectance to be improved in GM V1/V2. The GM V1/V2 national and regional version is most popular and most utilized global map dataset, produced by National Mapping Organizations of respective countries under their responsibility, without any responsibility assume of ISCGM for the contents of data. It contains eight layers, four vector layers (populations centers, drainage, transportations and boundaries) represented in VPF, Shape and/or GML formats, and four raster (elevation, land cover, land use and vegetation) layers in TIFF and/or BIL format. GM vector data of V1/V2 (national and regional version) stored as edges and faces are individually structured, which means that GM vector data is partly topologically structured, with intense to keep the logical consistency of data, and non duplicate features. GM raster data of V1/V2 (national and regional version) is organized and accessed by rows and columns with the cell size (spatial resolution) 30”x30”, with the origin on the north-west corner of the tile. The attribute of each cell represent a characteristic that is dominant nearby the center point of cell, stores band by band for each line, or row, of the image. Three out of four layers (vegetation, land cover and land use) are in 8 bit unsigned data, and the fourth layer (elevation) data in 16 bit signed in Motorola (big-endian) byte order (Idrizi B. et all, 2010). The GM V1 global version was developed as additional raster data aimed to replace existing raster layers (land cover, land use and vegetation). It contains two raster layers, Land cover and Vegetation (Percent tree cover), all of them available on BIL and TIFF formats, with the same spatial resolution of 30”x30” as raster data of national and regional version, with the origin being the north-west corner of the tile. GM V1 (global version) data are uploaded and available for utilization in Google Earth (figure 2). The data were created by using MODIS data observed in 2003 (TERRA Satellite), with cooperation between participating NMOs and Center for Environmental Remote Sensing (CEReS), Chiba University, coordinated by ISCGM (Tateishi R., 2005). The reference coordinate system of Global Map is ITRF94, and its longitudes and latitudes are defined in GRS80 Ellipsoid, stored in decimal degrees to a minimum of three decimal points as geographic coordinates with southern and western hemispheres having a negative sign for latitude and longitude. Since the difference between ITRF94+GRS80 and WGS84 is negligible in spatial resolution and scale of Global Map, WGS84 can be used also (GM specification V1.3./V2). The positional accuracy of spatial data based on the composite errors from three sources: which are the positional accuracy of source material, errors due to conversion processes, and errors due to the data processing. For horizontal accuracy, 90% of points need to be within ±2km of their actual location, and in the case of data obtained from satellite images, the maximum error is less than or equal to 0.5km. In other site vertical accuracy is notionally ±150m for 90% of points (GM specification V1.3./V2). GM data is in use of GEOREF tiling naming system, which does not allow overlaps or gaps between the tiles, with the the reference for their southwest corner. It uses two pairs of letters. The first pair of letters represents the coarsest, 15° by 15° standard GEOREF division, and represents the first coordinate pair identifying the tile name. The second pair of letters represents the 1° by 1° standard GEOREF divisions, and represents the second coordinate pair of the tile name. In the other site, the tiling system of GM V1 global version uses the dividing system of 30° x 30° starting from the equator and the Greenwich meridian (Idrizi B., et all, 2010). Environmental issues are closely interlinked one leading to another. A local environmental problem may grow into regional or even global environmental problem, and a global environmental degradation may create a new environmental problem in various other parts of the globe hitherto unaffected by it or it may aggravate the existing local problems. This is precisely because a global outlook is essential to understand the environmental problems affecting our surroundings and to provide a holistic solution towards the same. Majority of environmental issues could be referenced to changes in Land Cover, Land Use due to manmade and natural causes (deforestation, desertification and loss of biodiversity), and industrial activities (air and water pollution, toxic wastes etc.). Due to the geographic nature of the majority of environmental issues, spatial analysis becomes an essential tool for environmental assessment, monitoring, and integrating environment, and development concerns for addressing such questions as: what is happening where, why, and how the problem is being solved. In the past, assessment and monitoring of anything on a global scale were practically impossible due to lack of globally consistent and comprehensive spatial datasets and of the ability to effectively analyze and use such large volume of datasets. Consequently, most of the monitoring and assessment activities were concentrated over small areas and the results derived often generalized for larger areas. The lack of suitable geographical dataset was one of the most serious impediments to the integrated spatial analysis and modeling (Idrizi B., 2006). Global Map with its consistent quality and data standards is a handy tool to monitor the environmental status at regional and global scale. With the Global Map dataset being in digital form, it lends itself to various data manipulation and for modeling real life situations. Global Map dataset may have limited uses at national and local scales. However, Global Map dataset is needed to address global, regional, trans-boundary and in many cases national concerns. Environmental priority setting, analytical studies over large areas, ext. By comparing of advanced capabilities from one site, global map data structure/standards from the other site and potential-projected utilizations of global map data from the third site, many limitations for its wide utilization have been recognized, mainly because of non harmonized data between the participant countries. Below some results from our research on level of utilization of global map data as major global environmental dataset will be presented. Non-recognition of States between themselves, etc. Topology of GM as defined in its specification "Vector data in the Global Map will be partially topologically structured. Features stored as edges and faces will be individually structured”, does not allow full spatial joint between objects in different layers and objects between two data sets. Due to fact that the GM data from geometrical point of view is partially topologically and non harmonized data coming from different sources (NMO’s), our efforts for its utilization for map compilation and spatial analyses resulted with limitations because of overlaps and gaps between the polygons, as well as non spatial joint between the line objects. Example which prove the above deficiencies are shown in the next figure 3, example along the borderline between Bulgaria and Romania. Absence of spatial continuity condition and appearance of overlaps/gaps prevents the utilization of this database for spatial analysis of the global issues etc. The GM specification allows GM data to have a different accuracy depending on the source data, where the difference can be up to four times (for 90% of point’s ±2km, and ±0.5km if the data comes from satellite images). If we convert dimensions of both errors in to printed map as hard copy, they are 2mm to 0.5mm, which are values much larger than the standards for mapping in scale 1:1.000.000. In fact this specification allows to each participant to use different sources with different quality for different areas of their countries and for different layers. This type of definition of non-homogeneous accuracy without any process of data harmonization in some way allows overlaps, gaps, and non spatial joint of data not only between different countries, but the data within the same country and between different layers. Because of some upper recognized problems in utilization of global map data for global issues, the relation between the data of raster and vector layers, as example the overlapping of lakes, seas and oceans with DEM (digital elevation model) have been a part of our research analyses. After several analyses of more than 20 examples, the differences resulted as much larger than projected accuracy for vector data and spatial resolution of the raster data. Above result can be seen in the next figure 4, in overlapped situation between the Bulgarian coastline along the Black Sea and DEM, as well as in the Brazilian GM dataset as overlapped vector data with DEM, where the differences in some places are more then 3-4km. Upper differences between the coastline and DEM beside the non-homogenous accuracy between the vector and raster data, and non-harmonized data, are coming from the differences on the defining of the level zero from the participant countries. This type of data is allowed in the GM specification, “the vertical distance between the surface of the earth and the standard sea level that the nation has defined” (GM specification 2&1.3, ISCGM, 2009). On the existing GM data available for download from the ISCGM’s web page, a large number of data with the attribute UNK (unknown) can be listed. This is an option given at the GM specification for all data with unknown attributes such as: unknown name of the river, unknown type of usage of airport, unknown seasonal availability of roads, etc. In other site, according to legal obligations on their own countries, national mapping organizations should possess native spatial data followed by their accompanying attributes. Due to fact that they are representatives of their countries in the global mapping project, utilization of UNK attribute about the unknown data is unreasonable and unacceptable for us. In such a situation in which from one site we have NMO’s as owner of native spatial data followed by their accompanying attributes, and in other site we have GM dataset with large number of unknown data attributes, derives the question: why the NMO’s have been used the attribute UNK?! Based on our research, probably the NMO’s have used the given opportunity by the GM specification, and not really because their institution or other responsible state institutions for spatial data don’t have the native information they possess. Calculating the accuracy of the heights within the Macedonian global map data set, have been made by defining the test model with 2191 points within the territory of Macedonia, extracted from the Macedonian topographic maps in scale 1:25000 with 10m interval. By comparing the test points with the Macedonian GM DEM, has been calculated the root mean square error (RMSE) for Macedonian GM DEM dataset which has the value RMSE=88m, which is within the projected accuracy of heights in GM specification of ±150m. From the list of test points, 217 out of 2191 points, approximately 10% of total test points, has the difference larger than ±150m, i.e. about 90% of points has the height error within ±150m (according to GM specification V1.3./V2). Maximum error find out from the test model was 460m. From 217 points with the larger difference than ±150m, 3 of them (1%) has the error between 400-460m, 7 points (3%) with error between 300-400m, 76 points (35%) with error between 200-300m, and 131 other points (61%) with error between 151-200m. Three characteristic slopes of terrain within the Macedonian GM DEM have been analyzed also (figure 5). First analyzed situation is terrain with average slope of 55%, where the maximum difference between the source data and the pixel value of DEM is 530m. The second situation is terrain with average slope from 56% to 63%, where the maximum difference of about 500m has been recognized. In third case of terrain with average slope of 20%, the maximum recognized height difference was about 100m. All above obtained results show the influence of the slope of terrain on accuracy of the GM DEM. Basically the idea for global mapping project was to replace the previous IMW (1:1.000.000) with a new map in digital form with the homogeneous standards for entire globe called global map. But if we take a look to the structure of global map since the beginning till today, namely its standards listed in its specifications, it is so clearly that global mapping is not designed as a standard map, but it represents the GIS database format with specific defined standards. The lack of cartographic key (cartographic symbols), the lack of cartographic/graphic representation, and absence of defined map projection are the main arguments which prove that global map it isn’t map but it is GIS database, i.e. global map oneself does not contain the basic elements that characterize a map. Based on these details, comes the expression mapping element which should be subject for GM revising in the next period by orienting the project in this regard (Idrizi B. et all, 2010). 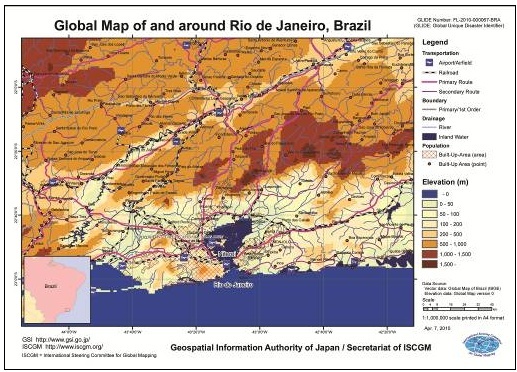 Because of the non defined cartographic standards within the global map, nowadays exists many maps prepared based on the GM datasets, free downloadable from the ISCGM’s web site (http://iscgm.org/cgi-bin/fswiki/wiki.cgi?page=Application) with total difference map design, starting from the map scale up to the map symbols. In bellow two maps, the differences between the same types of map with the same scale prepared from the same dataset from the same organization can be recognized. The differences are coming as a result of absence of defined standards for global map symbols and its design. The relation between the roads and rivers; ect. 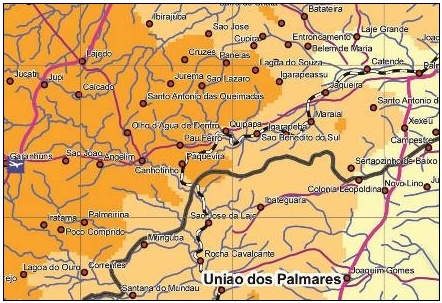 In the next figure 6 is given an example of GM data in which because the absence of the relation between the population centers and transportations layers, many cities have not any connection with any type of road. But, is it possible to exist any population centre (city or village) without connection to any type of road?! Of course it is impossible. Because the vector data in the Global Map is partially topologically structured, full spatial analyses between objects (road network and population centers) in different layers are not possible. The GM V1/V2 national and regional version is most popular and most utilized global map dataset, produced by National Mapping Organizations of respective countries under their responsibility, without any responsibility assume of ISCGM for the contents of data. In the other site, the GM V1 global version was developed as additional raster data aimed to replace existing raster layers (land cover, land use and vegetation), which contains two raster layers (Land cover and Percent tree cover), available in Google earth also. The data structure within the Global Mapping project is adapted in to ISO/TC 211 standards for geographic information, i.e. 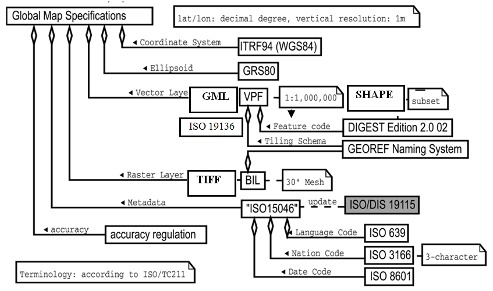 ISO19136, ISO 3166, ISO 19115, ISO 19139, ISO 15046, ISO639, and ISO8601. The horizontal accuracy of 90% of points need to be within ±2km of their actual location, and in the case of data obtained from satellite images the maximum error should be less than or equal to 0.5km. In other site vertical accuracy is notionally ±150m for 90% of points. Idrizi B. 2005. Global map action plan of the Republic of Macedonia; ISCGM; Tsukuba; Japan. Idrizi B., 2006. Developing of globally homogeneouses geographic data set through global mapping project. Zagreb. Croatia. Cartography and geoinformation. Idrizi B., 2007. Globaly understanding the current situation and changes of environment of the world. Skopje. Macedonia (FYROM). Acta Lingua Geographica. Idrizi B., 2010. Kosova in Global Map. Nessebar, Bulgaria. 3rd ICCGIS. Idrizi B., Meha M., Nikolli P., Kabashi I. 2010. Overview on Global Map as contributor of GSDI. Skopje, Macedonia (FYROM). SDI 2010-Skopje conference. Kishimoto N. (2005): Process of GM development; handout; Geographical Survey Institute; Tsukuba – Japan. Tateishi R. (2005): Report of the ISCGM working group 4 on raster data development; Cairo. Egypt. Twelfth meeting of ISCGM. Bashkim IDRIZI, was born on 14.07.1974 in Skopje, Macedonia (FYROM). He graduated in geodesy department of the Polytechnic University of Tirana-Albania in 1999year. In 2004, hot the degree of master of sciences (MSc) in Ss.Cyril and Methodius University-Skopje. In 2005 he had a specialization for Global Mapping in Geographical-Survey Institute (GSI) of Japan in Tsukuba-Japan. On year 2007, he held the degree of Doctor of sciences (PhD) in Geodesy department of Ss.Cyril and Methodius University–Skopje. He worked in State Authority for Geodetic Works from May 1999 until January 2008. During those period, in 2004 he appointed for head of cartography department, i.e. geodetic works. From October 2003 up to January 2008, he worked as a outsourcing lecturer in State University of Tetova. From February 2008, he works as a cartography and GIS Professor at the State University of Tetova–Tetova. He continuo with working as outsourcing lecturer in geodesy department of the University of Prishtina-Kosova. He is the author of three cartography university books, and more than 60 papers published and presented in national and international scientific conferences related to geodesy, cartography, GIS and remote sensing. From March 2010, he is appointed as president of Geo-SEE (South-European Research Association on Geo Sciences). Murat Meha is a University Professor and Deputy Head of the state Border Demarcation Commission. He has been teaching at the University of Prishtina - Kosovo since 1988. He has also taught for ten years at Tetova University (FYR of Macedonia). He worked for five years as Manager of SEO Ferronikeli, for three years as a CEO of Kosova Cadastre Agency, in different funded EAR projects, USAID project, KTA etc. His teaching and research concern survey, cadastre, Land Administration and Land management. and related educational and capacity building activities. He is currently the member of Kosova Surveyor Association. Main publications of Mr Meha are on survey, cadastre, Land Administration and Land management. He published two University books, two books for Kosovo Cadastre Agency, one book translated, and several school geographic atlases and maps. More than 80 professional and science papers in different professional magazines, symposiums, conferences etc. Most of those articles are available on Internet at: FIG, ICC, Euro Geographic, WPLA, CELKCenter, FAO GIM International etc. Pal Nikolli Graduated at the Geodesy branch of Engineering Faculty, Tirana University. In 1987 has been nominated lecturer in the Geodesy Department of Tirana University. In 1994 has been graduated Doctor of Sciences in cartography field. During this period, have taught the following subjects: “Cartography” (for Geodesy and Geography students) and “Geodesy” (for Civil engineering & Geology students). Actually he is lecturer and tutor of the following subjects: “Elements of Cartography” (for Geography students), GIS (for Geography students, diploma of first and second degree) “Interpretation of Arial Photographs” (for Geography students, diploma of first degree), “Satellite Images” (for geography students, diploma of second degree) “Thematic Cartography” (for Geography students, diploma of second degree) and “Topography-GIS (for the Geophysics students, diploma of second degree). Mr. Nikolli is the author and co-author 8 textbooks (Elements of Cartography and Topography, Elements of Cartography, Geographic Information Systems, Processing of satellite images, Cartography, etc), 3 monographs (History of Albanian Cartography, Mirdita on Geo-Cartographic view, etc), more than 40 scientific papers inside and outside of the country, more 40 scientific & popular papers, etc. Has participated in several post graduation courses of cartography and GIS outside of the country (1994, 2000 - Italy), etc. Ismail Kabashi, was born on 08.08.1965 in Prishtina, Kosova. He graduated in geodesy department of the University of Saraevo-Bosnia and Hercegovina in 1992year. In 2003 year, he held the degree of Doctor of sciences (PhD) in Geodesy engineering department of TU Wienn–Vienna. Currently he is employee in Vermessung ANGST GmbH ZT as project manager for Planning and execution of Cadastre and Geomonitoring Projects. From year 2004, he works as a geodesy engineering Professor at the University of Prishtina-Kosova. He is the author of many papers published and presented in national and international scientific conferences related to geodesy and engineering geodesy, as well as the author of script for students in geodesy engineering field. State University of Tetova, Faculty of Natural Sciences and Mathematics.